Retrieve a missing Dibella Statue for a struggling store. "You aren't for hire, are you?" 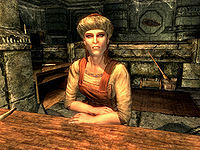 Near the market in Markarth is the general goods store, Arnleif and Sons Trading Company, where the proprietor Lisbet is struggling to keep her business afloat. Not only did she lose her husband, Gunnar, in a Forsworn attack, she also lost dozens of shipments to the Forsworn, including a precious, specially-made Statue of Dibella. She believes this statue would put the store back on its feet. When you speak with her, she is ashamed of the state of her shop and will then ask you a question: "You aren't for hire, are you? A sellsword? I'll pay you if you can recover that statuette from the Forsworn." Accept the task and she will promise you a great sum of gold for your efforts and the quest will be added to your journal. Once you have claimed the statue, return to Lisbet in her store. When presented with the item, she is overjoyed, saying: "Ah, there it is! This little gold delight is going to keep us afloat for a while. Thank you. Here's something for your hard work." She will then hand you a leveled amount of gold as a reward. Oddly, you can buy the statue back from her for less than your reward at any level. You are prevented from starting this quest if you've already killed all enemies in the Forsworn camp before talking to Lisbet. Enter setstage FreeformMarkarthE 12 to skip forward in the quest. If you retrieve the statue after the completion of this quest, it will become stuck in your inventory as a quest item. In case Lisbet is killed before completing the quest, both statue and objective will get stuck. Enter setstage FreeformMarkarthE 20 to manually complete the quest: you will receive the reward, and the statue will be removed from your inventory. The following empty quest stages were omitted from the table: 12, 20. On the PC, it is possible to use the console to advance through the quest by entering setstage FreeformMarkarthE stage, where stage is the number of the stage you wish to complete. It is not possible to un-complete (i.e. go back) quest stages, but it is possible to clear all stages of the quest using resetquest FreeformMarkarthE. This page was last modified on 15 October 2017, at 20:30.